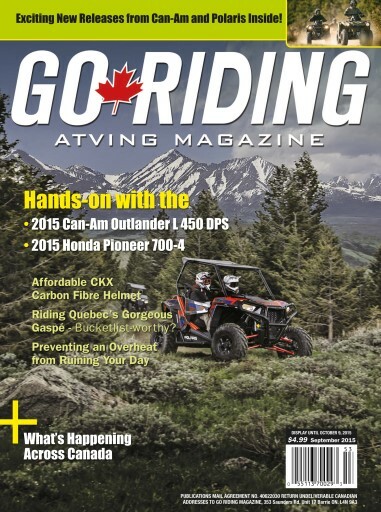 (0 Customer Reviews) | Write Review 4 issues per year GO RIDING Magazine focuses on the lifestyle of ATVing. GO RIDING reaches out to the millions of enthusiasts across the country to encourage and promote the fun that recreational ATVing offers Canadians from coast to coast. We bring you destination features, ride reviews, product tests, easy-to-follow do-it-yourself projects and more. When you can't be on the trail, this is where you'll want to explore! From Can-Am and Polaris for 2016. Lots of new innovations from two big industry players. Ride Test and Review: 2015 Can-Am Outlander L 450 DPS. Does budget price mean budget performance? CKX TX707 Off-Road Helmet. Finally- affordable carbon fibre protection! Ride Test and Review: 2015 Honda Pioneer 700-4. Versatile for work, now how does it play? Event Report: Renfrew County ATV Club. “B101a or BUST ATV Rally. Here’s a gang who knows how to have fun! 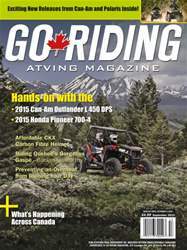 GO RIDING Magazine focuses on the lifestyle of ATVing. GO RIDING reaches out to the millions of enthusiasts across the country to encourage and promote the fun that recreational ATVing offers Canadians from coast to coast. We bring you destination features, ride reviews, product tests, easy-to-follow do-it-yourself projects and more. When you can't be on the trail, this is where you'll want to explore! You'll receive 4 issues during a 1 year Go Riding ATVing Magazine magazine subscription. You'll receive 4 issues during a 1 year Go Riding ATVing Magazine magazine print subscription.